Image caption Miss Power's family described her as "happy, fun-loving and considerate... the consummate mum". A campaign has been launched to raise awareness of how to call 999 when you are too frightened to speak out loud. The Independent Office for Police Conduct watchdog warns it is "not true" that a silent 999 call alone will automatically bring help. Callers are then led through a series of prompts and asked to press 55 to confirm there is a genuine emergency. The system has been in operation since 2002 but police say many callers don't understand, or use it correctly. The system, called Silent Solution, filters out thousands of accidental or hoax silent 999 calls made daily - but it also could lead to genuine calls being terminated if the callers do not respond to the prompts. 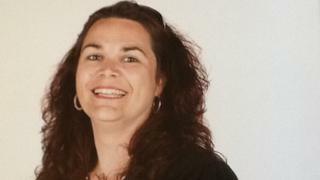 The Independent Office for Police Conduct's campaign is being supported by the family of Kerry Power, 36, who was killed by her ex-partner in Plymouth, in December 2013. She had made a silent 999 call but did not respond to the BT operator and so was transferred to Silent Solution. As 55 was not pressed, the call was terminated and Devon and Cornwall Police were not notified of Kerry's call. The IOPC is launching a poster campaign, backed by a how-to guide, aimed at "debunking the myth" that a silent 999 call alone will automatically bring help. Regional director Catrin Evans said: "It is always best to actually speak to a police call handler if you can, even if by whispering, but if you are putting yourself or someone else in danger by making a sound, there is something you can do. Miss Power's family said in a statement: "Although she was not able to speak for the fear of alerting the intruder to her actions, she followed the advice given by a police officer during an earlier visit." However, the family said she had not been told to press 55. "A short while after the call, she was strangled," their statement added. David Wilder, 44 at the time, was jailed for life over her death. However, the subsequent investigation into the police response found Miss Power might have been wrongly advised by a police officer about when assistance would be sent. Ms Evans said the inquiry identified a "lack of public awareness" about the method of alerting police that "could potentially save a life". Lucy Hadley, from Women's Aid, said: "We need to look at all ways we can raise awareness and make the system work better for the people it's designed for, which are people in extreme distress and fear, and might not necessarily remember everything... on a poster or advertising campaign."